Early Start to Tropical Season? April 21, 2 PM Update: As of 2 pm EDT, the National Hurricane Center has lowered the chances for tropical development from this system to 10%. Weather Underground's Dr. Jeff Masters agrees that the likelihood of development is low. The NASA visible satellite image (click to enlarge) shows the storm at 17:45 UTC (1:45 pm EDT) today. The center of circulation is west of the largest area of clouds. There has only been one named storm (or equivalent in the pre-naming era) in April since Atlantic tropical cyclone records began in 1851. 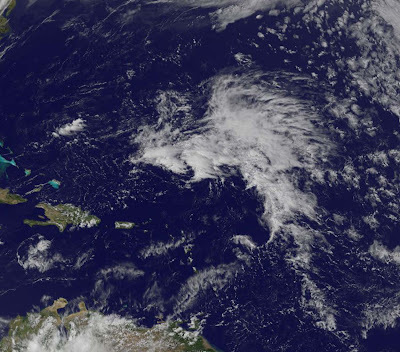 That was Ana, which formed on April 18, 2003. There was one tropical cyclone in February 1952 and one in March 1908. The Weather Channel's severe storm expert Dr. Greg Forbes is reporting that the preliminary total of 272 tornadoes through yesterday breaks the April record of 267 in 1974. 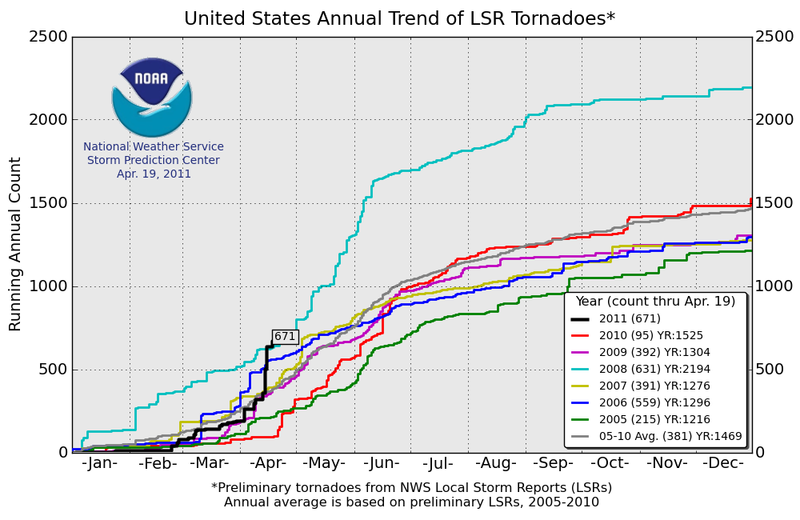 The average number of April tornadoes is 163. 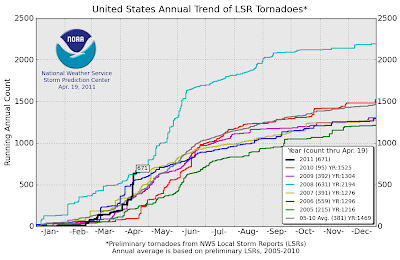 The graph (click to enlarge) from the National Weather Service's Storm Prediction Center shows the cumulative annual total of 671 tornadoes to date outpacing the 2008 count of 631. April 20 Update: The final daily snowfall total for Green Bay was 9.9". Despite the unseasonable cold of the last few days, the month of April so far has been within 0.7° of the long-term average in Green Bay. On the other hand, the month-to-date precipitation of 3.92" is slightly under 2.5 times the average amount. The season-to-date total of 7.00" is also almost double the average. AS OF 9 PM THIS EVENING...8.7 INCHES OF SNOW HAD FALLEN IN GREEN BAY. THIS IS THE GREATEST DAILY SNOWFALL EVER SO LATE IN THE SEASON. MOST SINCE THE WINTER OF 1889-1890. This exceeds by half an inch the 8.2" which fell 4 days later in the month on April 23, 1910. 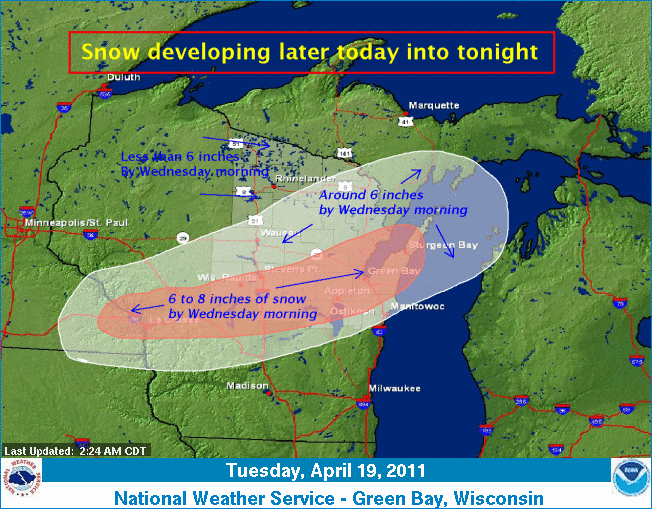 Measurable snow has fallen as late as May 28, when 3" fell in 1947 at Green Bay. A RECORD SNOWFALL OF A TRACE WAS SET AT MILWAUKEE WI ON APRIL 19. THIS TIES THE OLD RECORD OF A TRACE SET IN 1990. APRIL 19. THE PREVIOUS RECORD WAS 0.93 INCHES IN 1993. A RECORD SNOWFALL OF 1.3 INCHES WAS SET IN MADISON ON APRIL 19. THE PREVIOUS SNOWFALL RECORD OF 0.3 INCHES WAS SET IN 1953. Happy Anniversary, BP Oil Disaster! Joel Achenbach: reporter, The Washington Post; writer for Achenblog; author of "A Hole at the Bottom of the Sea: The Race to Kill the BP Oil Gusher." Frances Beinecke: president, Natural Resources Defense Council; former member of the National Oil Spill Commission. Randall Luthi: president of the National Ocean Industries Association and former director of the Minerals Management Service. The breakdown by intensity, shown on the map, includes 5 tornadoes at EF-3, including the large storm which passed through Raleigh. Midnight Update: The New York Times reports ("Experts Busy Assessing Ferocity of Storms") that the NWS is estimating "that North Carolina was hit by 15 to 20 tornadoes on Saturday — about the average number the state had in an entire year." The Raleigh News Observer has a review of the tornado outbreak in Tuesday's edition (Piecing together a deadly weather day) plus photo galleries with hundreds of images locally and statewide across North Carolina. See here for an interactive map of storm damage photos in the city of Raleigh. COUNTY JUST EAST OF HARRIS LAKE. The Weather Channel's Jim Cantore twitches that this may have been the largest tornado outbreak in North Carolina history.